This week’s OMEGA Processing Game of the Week for the second round of the playoffs features Dixie (8-3) vs. Simon Kenton (11-0). Last week, Dixie beat Central Hardin 49-6 to advance while Simon Kenton took care of Southern 58-6. This Class 6A game will be a rematch from last month when the Pioneers defeated the Colonels 19-14. And the winner of this game has a very good shot at making it to the Class 6A Championship game. Simon Kenton is led by their Senior QB Brenan Kuntz who has passed for 2,157 yard and 29 TD’s to go along with 820 yards rushing and 13 rush TD’s. Stopping Kuntz will be key for Dixie. Dixie is led by Junior QB Drew Moore who has passed for 1,354 yards and 11 TD’s and rushed for 948 yards and 10 TD’s. Dixie’s Senior RB Darion Washington also has 1,241 yards rushing and 11 TD’s. Last week’s Game of the Week featured Carroll County vs. Newport. Senior Blake Newby was our OMEGA Processing Player of the Game as Carroll County defeated Newport 29-21 in the first round of the Class 2A Playoffs. Paris has the better record coming into this Class 1A game but look for Beechwood to win this game. They’ve beaten Paris the previous two years in the playoffs with scores of 63-16 and 60-7. Bellevue lost to Frankfort last year in the playoffs 26-0 and is looking to make this a better game with their passing attack. Tyler Ackerson has thrown for 2,860 yards and 26 TD’s for the Tigers. 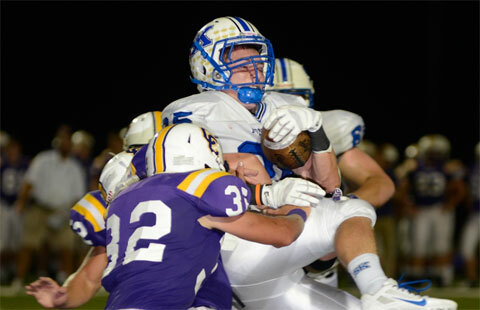 NewCath has won 6 straight games and defeated Walton-Verona last year in the playoffs 49-14. The Bearcats edged Lloyd last week 21-18 and will have to play a perfect game to defeat the Breds. The Tomcats come to Ft. Thomas again where they lost last year 52-13. Expect the same result this year as Highlands will continue to roll this weekend. This should be a good game to watch as the Colonels have won 6 straight and return some key players from injury. CovCath defeated Johnson Central 45-15 last year but the Golden Eagles are undefeated this season and averaging 58 points per game. Campbell County travels to Butler after defeating PRP last week 31-14. This should be an interesting game between two teams that haven’t played each other before. The Bears defeated Ryle last week 48-14 and have won 5 straight. The Camels have also won 5 straight.